Welcome to our annual Holiday Gift Guide where the flock takes a break from talking about all the awesome and not so awesome things to, well, talk about some more of the awesome things that you might want to consider for your Holiday shopping this year. Today, we're talking gaming - mobile, console, PC, tabletop and board games! 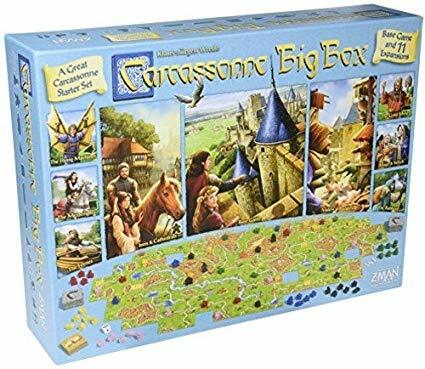 Do you want to play a game set in medieval France that is all about building roads and cities and making sure that your farm can touch as many cities as possible? You do, actually, because that game is Carcassonne and it is absolutely delightful and wonderful. 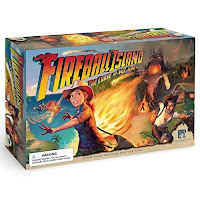 I won't go so far as to say that has taken over my house, but it is the board game my wife and I have played significantly more than any other in the year that we've had the game. 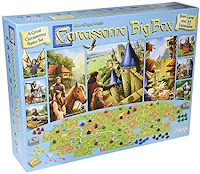 The Big Box (2017 Edition) collects the base game, 9 mini expansions to the game, and two of the most popular full expansions (Inns and Cathedrals, Traders and Builders). It's a big jump into the game, but if you're the sort of player who likes expansions and trying new rules, you'll want to jump right in to this Big Box edition. I know I called Assassin’s Creed Odyssey “a popcorn game, tasty but void of nutrition or substance.” It still is popcorn, but who doesn’t like popcorn? 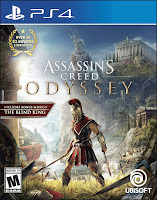 Odyssey is a game made for wide appeal to the wildly diverse audience of “people who play video games”. If you’ve got a friend or cousin you need a gift for and all you know is that they play video games, you can’t really go wrong with Assassin’s Creed Odyssey. It’s lengthy, diverse in gameplay options, and features a cast of characters they probably heard of at some point in school. 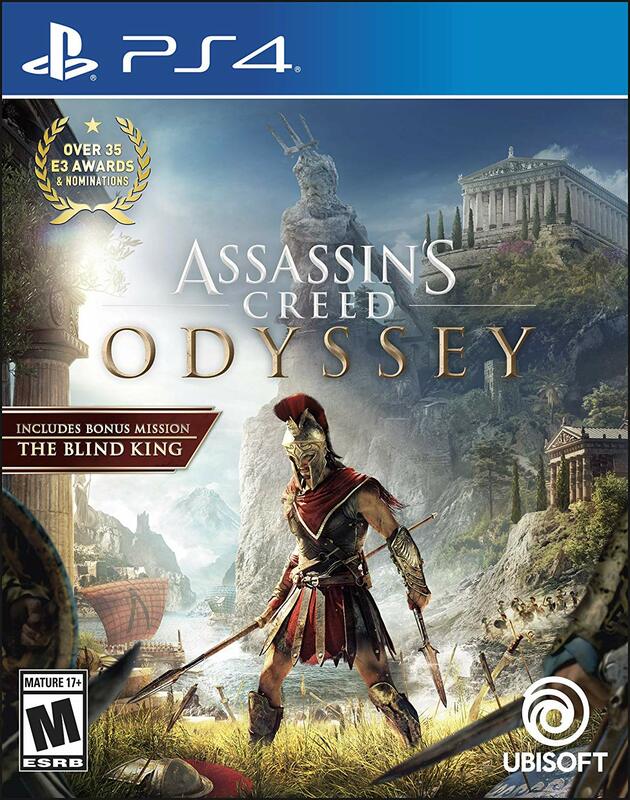 Assassin’s Creed Odyssey is a safe choice to get someone who enjoys video games. If you have a gamer in your life, they have had a busy, expensive few months. Red Dead Redemption 2 and Fallout 76 and currently occupying my personal time and money, so someone taking care of my PlayStation Plus subscription for a bit would be incredibly appreciated - and not terribly expensive for the gift giver! It makes a great stocking stuffer, and it's something any gamer will put to good use. 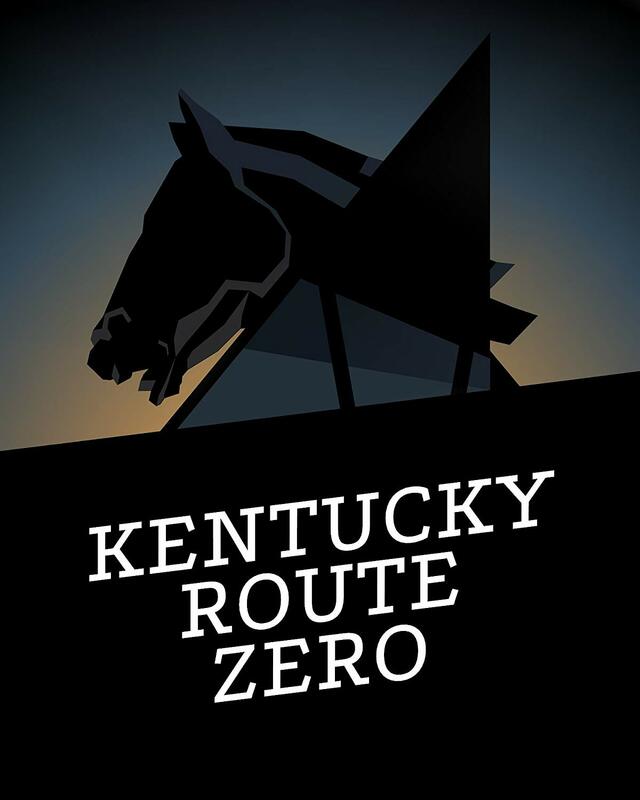 Kentucky Route Zero is an adventure game without the esoteric puzzles. It’s more about exploring spaces and talking to people. There are no wrong choices. It’s a journey through surreal locations mostly made of beautifully crafted flat polygons and populated with lonely people. Its minimalistic design and lack of punishment makes it accessible to nearly everyone, even if the slow pace will turn some people off. 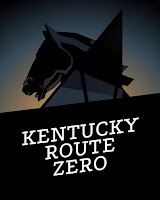 Sometimes funny, sometimes somber, always thoughtful, Kentucky Route Zero is a great game to play with a friend and talk about just what’s going on. It’s also a gift that keeps on giving as it’s not quite complete yet. The fifth and final act has been in development since the release of the fourth act in 2016. It’ll be finished eventually, but good stories sometimes take a while to tell. You may have recently heard of the passing of RPG legend Greg Stafford. Greg Stafford was a key figure in a number of roleplaying games, and founded a number of a couple of roleplaying game companies, including Chaosium. What is best known for, the single RPG word; Glorantha. Glorantha is Stafford’s greatest creation, an ever evolving and growing mythic world that he channeled and filtered from an unfathomable outside source as much as he wrote down. Glorantha is a bronze-age like fantasy world like very few. The world is flat, with the boundaries in all directions leading to the realm of the Gods. There are thousands of Gods, and the world has been changed radically several times in its history…including one of those changes being the invention of time AND history. But there are some things that are the same—or are they? There are Elves—but they are living plants. There are Dwarves, workers in the world machine who hope to be purified into creatures of metal. There are trolls—but they eat evil creatures of Chaos. And then there are the Durulz, or as everyone else calls them, the Ducks. Yes, Ducks. Ducks are figures of comedy, not the strongest race on Glorantha by any standard, but they are dedicated undead-hunters. There have been a few systems like Runequest and Heroquest that have tried to capture the world of Glorantha and allow it to be a playable world and system, but there is a large learning curve when you have a system *and* a vastly complicated world to try and navigate. Glorantha often gets admired but not played and that is a terrible shame! Glorantha is such a rich place that it should be explored and loved by more gamers than it is. But, you regular gamer, you can play and run Glorantha, and relatively easily, too, without too much of a stick shift change in systems. You, oh GM of the weekly D&D group, can give your PCs the richness of Glorantha, too. Let me introduce you all next to 13th Age. 13th Age emerged in the explosion of D&D like systems that occurred around the creation of 4th Edition. 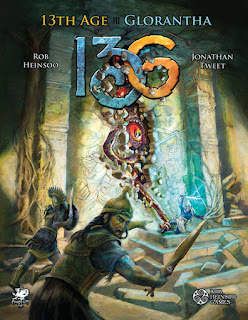 13th Age’s D&D like mechanics and character builds and creation are relatively easy for D&D players to port into. Hit points, Hit Dice, Saving Throws, character classes and races, spells and the like are all very much in line with what a D&D player might encounter. It’s not a formless D&D clone, however, with meddling Icons that influence the world at large and have connections to players. The escalation die provides new mechanics and tempo for combat. Every PC has “one unique thing”, which provides story hook and ideas for GMs to incorporate PCs history into the campaign. 13th Age is my favorite of the current crop of D&D and D&D like games. 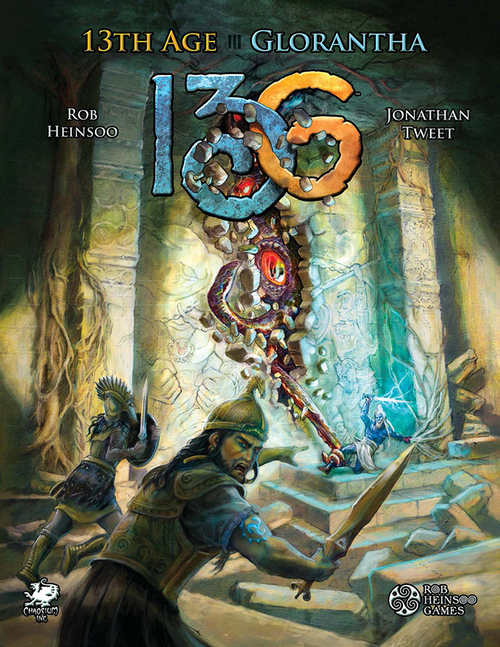 13th Age in Glorantha, recently released by Pelgrane Press, is the fusion of these two that gives you a roleplaying experience in Glorantha, with the D&D like engine of 13th Age that you will find relatively easy to pick up. It expands some of the rules of 13th Age to allow for Gloranthan concepts such as runes to work within the rules of the core system, replacing the Icons of the base system as the focus for character relationships with greater powers. Together, now you can roll dice and wade into the desperate fight against the tyrannical Lunar Empire, support your tribe against its rivals, deal with monsters, or explore ruins from past ages of the world. The default location for characters and their people is the tumultuous Dragon Pass, an area of Glorantha full of history and dangers. The locals are under threat, there are numerous colonies of creatures benign, neutral and dangerous alike, and there are surprises around every corner. In other words, its like any sandbox D&D world full of adventure. And with the prophesied Hero Wars about to erupt…perhaps the heroes might become Heroes. Or the GM and players alike can really get into the spirit of the mythic root of Glorantha, and travel into the God Time, into the realms of myth, and reenact the stories of their Gods, to gain power for themselves and for their tribe. With great risk, comes great rewards, for the PCs and their loved ones alike. Together, 13th Age and the 13th Age in Glorantha do what earlier iterations of Glorantha sometimes fumbled to achieve for many gamers: to give gamers a chance to explore and make the wild, mythic, magical world of Greg Stafford their own. Including the Ducks. One of the best parts about giving people games is that you usually get to play them! So it's kind of a gift you give yourself, as well. D&D is entering the public consciousness in ways it didn't seem to before, and a lot of people are genuinely excited to try it, where it used to be, well, the sort of people who frequent sites such as this. So maybe you have friends and/or family who have said they want to give it a shot. 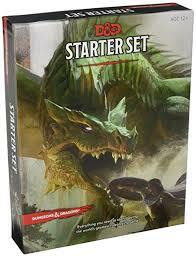 The starter set includes everything you need to get going - a rues manual, ready-to-play adventure that is pretty easy to jump right in to DM'ing, character sheets and dice. Oh, and it's under twenty bucks.